Jason, so the Greek myth tells us, set sail from Volos in search of the Golden Fleece. My window looks out over the Pagasitic Gulf down which he steered his fragile wooden boat, the Argo, with his sailors at the beginning of their great and wonderful adventures. Above is Mt Pelion, home of the fabled Centaurs – half man, half horse – among whom the wisest was Chiron, tutor of the young Jason. 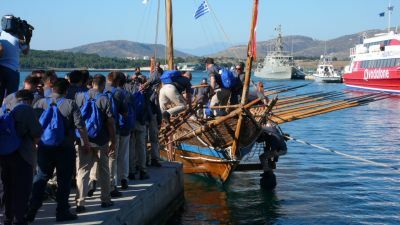 On June 14th, 2008 a replica of the Argo left from Volos on what was originally intended to be the same course as that taken by Jason, but was instead heading to Venice as the Turkish authorities refused permission for it to pass through the Bosphorus. The building of the replica is itself a fascinating story: all tools used were made by hand exactly as the ancient originals were; traditional shipbuilding techniques were employed; wood was sourced and handhewn on Mt Pelion; no modern method or equipment was used. On the morning of the launch we rose early to drive to Volos seafront, and great was the excitement! I’ve posted some of the photos we took, but a quick search of Google will yield far better ones, as well as videos. When the order was given to raise oars, a shiver ran through the crowd, which seemed to be holding its collective breath. Children scampered about, some were hoisted onto shoulders for a better view. Eyes anxiously scanned the sky for cloud, and nervously glanced at the huge ferries through which the tiny Argo would thread her way. Then came the call to dip oars! An enormous shout went up, a tumult of voices roaring encouragement. Boats of all sizes sounding their horns. Hands waving, hands clapping, hands shaking flags and not a few hands wiping tears. Historians and archaeologists believe that the Jason myth is based on fact, for there were indeed many adventurers who sailed in search of gold in the areas around the Black Sea. A sheep’s fleece is still used in some parts to sift gold from sluice water, and long is the history of fleece and the wool produced from it. I have rather a large stash of wool, for I love to knit, and my very own Jason who travels about quite a bit. Jason is a glass head on whom I once placed a hat I was knitting in order to take a photograph, and who now serves to record various hats and other bits of my knitting. Here he is, gazing down on Volos from one of the mountain villages. This entry was posted in Uncategorized and tagged archaeologists, Argo, Black Sea, Bosphorus, Centaurs, Chiron, Golden Fleece, Greece, Greek myths, historians, Jason, Mt Pelion, Thessaly, traditional shipbuilding, Venice, Volos. Bookmark the permalink. Yes, this just keeps getting better!